I am working on a weather balloon project and I'm trying to figure out my GPS transmitter. 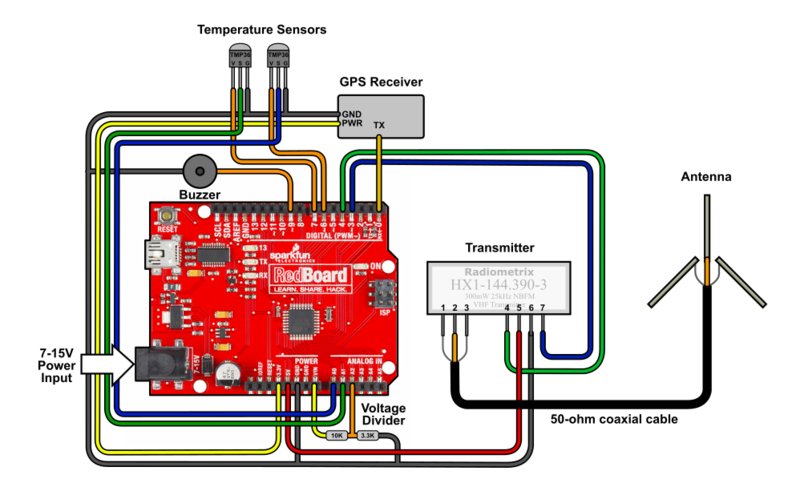 I'm using a Radiometrix HX1 radio module with an Arduino Uno 9v, 1A power supply. At this point it's all plugged into a breadboard as I'm still testing everything. For the antenna I'm using a 1/2 wave monopole whip. The antenna is connected to an SMA connector soldered to a PCB with soldered jumper wires going to the antenna pins on the HX1. Everything complies and uploads fine to the Arduino. The GPS locks to multiple satellites and it appears to transmit fine. For testing I've got a USB SDR dongle running SDRConsole(v2), Packet Engine Pro, and APRSIS32 on Windows 10. I've had no problems picking up APRS signals with the SDR, decoding the messages on Packet Engine, and mapping it on APRSIS32. However... when the SDR picks up the transmission from the Arduino, I get nothing on Packet Engine and nothing on the map. The transmission also sounds a bit different from others that I've heard. Other signals sound like a fax, defiantly data. Mine sounds more like a brief beep lasting about a second. I feel like I'm doing something wrong and can't pinpoint it. My best guess is that for some reason it's not transmitting correctly. I would really appreciate any help that anyone can offer! Thanks! Mine sounds more like a brief beep lasting about a second. The transmitter is not working correctly. Works well for me using standard radios. You might ask the author about interfacing it with the HX1. Many people are turning to LoRa for balloons, and some have demonstrated communications at over 700 km with cheap, very low power modules.